Here’s what they are saying about the May 2016 Liveaboard Trip! 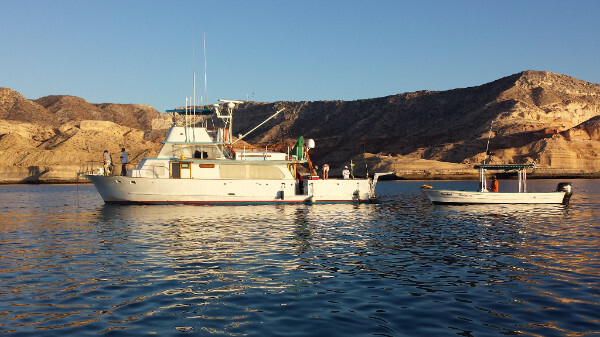 “Chay & Linda, and all at Sea Sniper Baja put together a truly fantastic adventure for us. From arrival to departure the trip was seamless, showing a great deal of preparation given the significant logistics involved. The accommodations, warm hospitality, gourmet meals, Chay’s genuine desire to put us on quality fish and diving experiences highlighted the trip for me. Chay was willing and capable of meeting the group’s needs/desires as the trip evolved. The entire crew and group of divers were a great collection of personalities and made for a memorable time. “Chay puts on a great spearfishing experience. The 5-day live-aboard boat trip to the north islands with Carlos as Captain was comfortable, clean and the meals were delicious. Chay put us on some nice fish, both in blue water and reef sites. I was able to load up my cooler with yellowtail, pargo, huachinango and AJs. I even got a few personal bests on huachinango & cabrilla. “I went to Sea Sniper Baja to dive with Chay and his team as a relatively new spear fisherman (about 1 yr experience). At first it was a little intimidating but that went away quickly when I realized that the team from Sea Sniper Baja was there to help. On our 5-day boat trip all over the Sea of Cortez, I learned an enormous amount. Great spearos and new guys like me mixed well, and we were all able to get fish. The captain of the boat, Carlos, had a great crew and they ran very fluid dive operations that were uninterrupted.